"Parsian Azadi Hotel, Chamran Highway, Yadegar Imam Intersection Built before the revolution, Parsian Azadi is a popular hotel. The hotel is located close to Evin and Tochal Mountains, where you can enjoy a nice weather. Parsian Azadi was owned by the Hyatt Hotels before the revolution. Even with the name change, the hotel is still one of the most well-known hotels of Tehran. 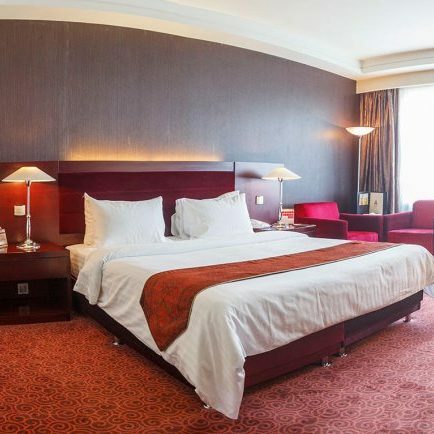 With its modern architecture, Parsian Hotel has it all. You can find anything you need in the hotel: shops, barber, dry cleaning, even an art gallery, topped with various cafes and restaurants, serving Persian and European dishes, and a very popular sports center with a swimming pool, sauna, and traditional bath. By staying at Azadi, you’ll be close to Chamran highway for easy transportation, while having various room types to choose from. "